Theo R of NY carries so much speed through turn 8 at Canada's famous Circuit Mont Tremblant that his inside tires get light. This page is where registry members articles on their RS America's will continue to be posted. How close can you get to an RS America? Paul P of PA The RS America that never actually existed! One Lap of America. Paul P of PA How one RS America driver earned his call sign! How preparation leads to performance. Eric S of VA The 3 slippery slopes found when attending Drivers Ed events. Finding the father of the RS America. Keith V of CA The importance of knowing your father. Little known La Junta David B of CO The CO Raceway where the track is almost always hot! This is definitely NOT your fathers RSA Bob W of IL & Keith V of CA How to add another 140 reliable bhp to your RSA. What exactly is an RS America? Keith V of CA A Panorama article on the RSA. RS America Cup Car upgrade Bert R of MD Performance upgrades and their effect. Preparation leads to performance - an enthusiasts story. by: Eric S of VA.
Driver's Ed instructor Eric S of VA powers through a turn with his RSA on 3 wheels. This article appeared in “der Vorganger” which is the region newsletter for Porsche Club of America's Potomac Region. It tells the tale of one man and his RS America and how a self confessed adrenaline junkie developed a passion for Driver Education events. His enthusiasm for driving his RSA on the track led him to become Track Coordinator for Potomac Region thereby enabling him to drive numerous track days throughout the year. To find out more about this well-established performance driving instructor and the car that he has refined over several years ....click on the image above. The importance of finding your father. by: Keith V of CA. Loook ......... I am your father! There are several stories circulating about the origins of the RS America; was it just a marketing ploy by the cunning sales department at Porsche when the late eighties/early nineties fuel crisis meant sales were seriously down? or was it a reaction to Porsche getting away from their performance sportscar image and producing highly optioned luxury cruisers? There appear to be a growing number of “haters” who are of the opinion that the RS America is not a real RS at all. Maybe they would benefit from understanding where the car came from and some of the limitations Porsche faced, causing them to bring the model to the US market in the form they did ....... but then again ........ maybe not. So whose idea was this car in the first place? Where did it come from? .... and why? To read an article answering these and other “origins of the RSA” questions ... .click on the image above. La Junta Raceway CO ... where the track is almost always hot! by: David B of CO.
More than 50 Porsches participated in this two day Drivers Ed on the 7 turn track at La Junta and three RS Americas where there to show them how it's done! To find out more about RSA's playing when the track is hot..... click on the trackmap above. The PCA RS America Registry meets in the Pacific North West. Registry members in echelon formation in the Porsche Paddock at the Parade '06 concours. For those of you who have never attended a Porsche Club of America Parade - you're probably wondering what all the fuss is about. The most common reaction to PCA Parade from non-attendees is “I don't have time to spend a whole week messing around with my Porsche with a bunch of people I don't know.” Well ..... simply put, you really don't know what you are missing. To find out more about this week-long event filled with too many Porsche related activities to list ...and to find out who sings like Pavarotti ..... to read the article click on the image above or click here. 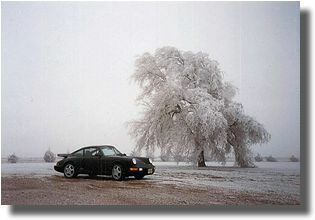 At PCA Parade in Fort Worth TX in 2004 I noticed a black 964 in the parking structure that looked like an RSA with non-stock wheels and a non-stock whaletail. I also noticed that the car had no “RS” side decals on its flanks and no “RS America” emblems on it's rear deck lid, however from the Vin# - which I could see through the windshield, I was able to confirm that it was an RS America. Rear seats and the letter “R” as the tenth digit in the Vin# told me that it was a 1994 model. As the car had PCA Parade entrant numbers on it, I knew I could look up the owners name and PCA Region. A closer look at the custom wheels revealed that they were the lightweight 18” made by RUF, and that the car also had upgraded “big red” brakes. As I walked away, I glanced back at the car and spotted a visual clue that was so glaringly obvious that I was surprised that I hadn't noticed it before - now it all made sense .... I realized that I was looking at an extremely rare Porsche indeed. The first clue ..... should've been the license plate .......! which should have been my first clue as to what I was dealing with. 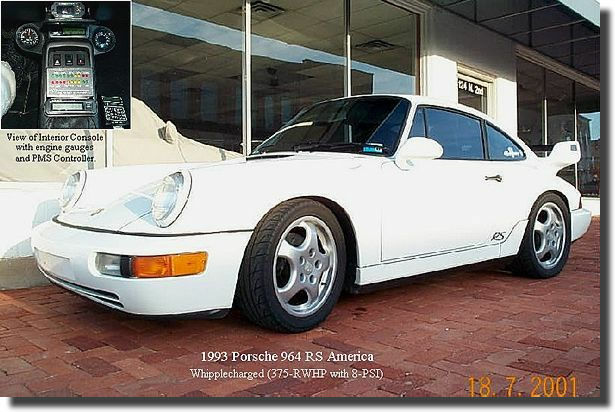 Unfortunately, I never got to meet up with the owner of the car in Fort Worth, so all I knew after Parade '04, was that a member of Chicago Region of PCA had an RS America that appeared to have been converted into RUF RCT. To find out more about this rare supercar ... to read the article click on the image above or click here. In an unashamed attempt to get the word out about RS Americas, and to publicize both the RS America Registry and associated rsamerica.net web site, I submitted an article to the Porsche Club of Americas' Award winning National Newsletter - Porsche Panorama. My rationale is that with a little over 320 RSA owners already registry members, there must still be a few owners who are unaware of its existence, and also of this web site. Hopefully, this article will enlighten them and maybe inspire them to participate, plus it is a chance to reach ex-RSA owners and hopefully get them to provide data on RSAs which are not in the registry database! What does this mean to the current owner? Basically, if more knowledge is spread about these cars, more interest might be generated, and the market value may increase! Realistically, the RSA may never achieve the legendary status of the 1973 2.7L Carrera RS, but all publicity is good publicity and an article such as this just might help! To read the article as published ... to read the article click on the image above or click here. Do you know how many FLY yellow RS Americas Porsche made? Do you know why they were called “FLY” yellow? Could it be because insects are attracted to the color? .... is there really such a color as Fly yellow? .... or is it just a misnomer? Which is the only option that ALL FLY RSAs have? Do you know the color of the RSA that was on display at the 1993 New York Auto show? .... (the above image is a huge clue). To find the answers to these and other fascinating questions - plus to view some other notable yellow Porsches ........ to read the article click on the image above or click here. THE LARGEST GATHERING OF RS Americas EVER!!! PCA Parade 2004 - Hershey PA.
A visual record of the 2005 RS America corral. DISCLAIMER: This article is not intended to cover all of PCA Parade 2005. Books (and newsletters) could be written entirely on this subject and would be unlikely to cover all the events or even to begin to do them justice. Please bear in mind that this is intended to capture one small part of one day of Parade, and that is the PCA RS America registry corral at the Parade concours. Dyno-day - 17th July '04. Keith V of CA with a confident smile ....... before the dyno testing began. On Sat 17th July '04, around 20 members of the PCA San Diego Region met at The Dyno Shop in Santee CA - around 15 miles east of downtown San Diego with the sole intent of answering the “how many horsepower?” question. The money shot ... RSAs as far as the eye could see ....... well, almost. RS Americas at PCA Parade 2004 - Fort Worth TX. The infield at Texas Motor Speedway in front of the Speedway Club. PCA Parade 2004 was a great event for anyone with any interest in Porsches and consisted of a week of pure Porsche indulgence in Fort Worth, TX. The Sunday night Welcome Banquet set the tone of the week's events, with door prizes (including a set of tires) and the presentation of several awards for achievement within PCA. RS Americas at the Ventura CA German Auto Fest. RS Americas at California Speedway, Fontana 7 June '03. Billed as the biggest Porsche event in Southern California - in June of this year San Diego Region of PCA hosted a PCA Club Race, a Driver's Ed event & Grand American Road Racing plus much more! RS Americas Cup Car Performance upgrade. by: Bert R of MD. The wide open sky, the wide open road and coming soon ..... the wide open throttle!! In keeping with the RS theme, the Brumos car was, at one point, fitted with a factory ducktail from the '73 RS. Below is the story of an RS America, which started life at the factory as a regular RSA but was delivered to Brumos ..... who gave it a whole new lease of life! RSA chase vehicle and RSA Track car. You may have seen an article about the Silver State Challenge in Panorama some time ago, but if you didn't, the following is a report on the event from the perspective of a couple of volunteer course workers. 2,970 miles from Annapolis, MD. to Los Angeles, CA. in six days in an RS America. Is your stock RS Americas 247 bhp just not doing it for you anymore? then here's something to think about. 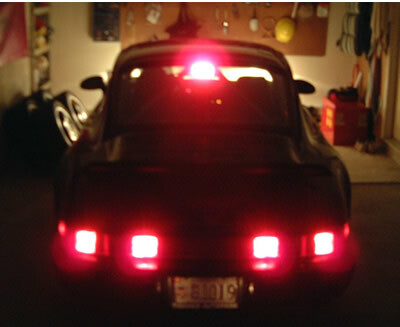 The RS America “Euro” Rear Fog Light. Rear lights, Brake lights and Rear Fog lights .......... voila!.